My team and I have had the opportunity to build applications for the Microsoft Hololens in the market of collaborative technologies. We believe that Microsoft has made very pragmatic decisions in building their Mixed Reality platform. We’re excited to see the Microsoft Holographic platform continue to grow. In March 2017, a broader group of developers will start to receive their Meta2 devices from Meta vision. The Meta2 device supports a 88 degree field of view and focuses on giving users the ability to naturally interact with 3D content. The Hololens currently supports the “mouse” user interaction pattern. You “click” on objects to interact with user interfaces. Meta vision has a bold vision of empowering users to interact with objects with a broad range of natural gestures. What’s new from CES 2017 in VR and AR? Microsoft has been hinting the Microsoft Hololens is just the beginning. We’re starting to see the Holographic platform expand with Lenovo’s new device. Got to love the price! 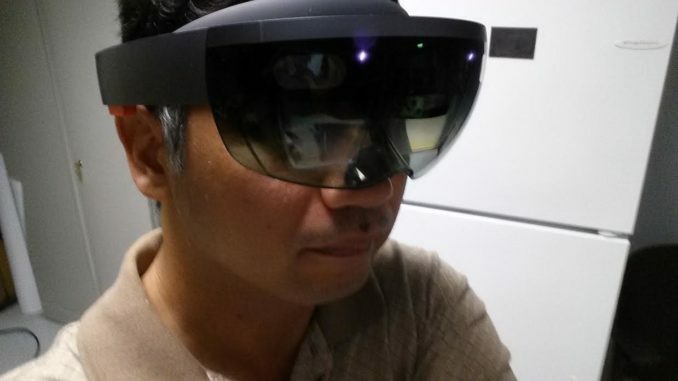 Since this device depends upon a speedy companion Windows 10 computer, the market will start to demand really light and powerful computers capable of powering AR/VR experiences. Our team has had the opportunity to create Android applications for the ODG R7. It seems that ODG is reaching out to the consumer market. What would you like to make with this technology?